I like growing food. There is something so nifty about going out the back door and picking stuff to eat. But, in general, I don't like the looks of vegetable gardens. 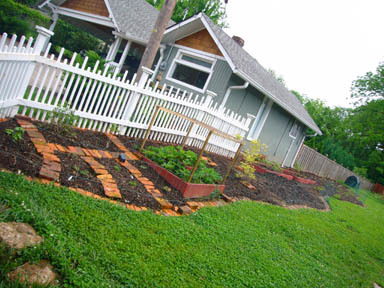 I long for pretty flowerbeds, even as I look forward to growing tomatoes and cucumbers. Obviously I'm not utilitarian enough to be a real farmer, who would totally mock my endeavor to unify my desire for a vegetable garden and an attractive landscape. Even my husband threatens every year to till a few rows up in the middle of the backyard and be done with it, but I bat my eyes at him and win him over. Last year, we created a pleasing shape for my vegetable beds, but by mid-summer (when I had a newborn) I gave up on a pretty garden. I also gave up on weeding and often on even picking stuff. My garden fell into a shambles, but we're picking up the pieces and starting again. First we put in black rubber edging and a border of bricks. This part is not just for looks (black rubber not being noted for it's attractive appearance afterall), but we've found that the black rubber which is buried and the bricks create enough of an edge for us to keep most of the Bermuda grass from creeping in. It can't go underground through the rubber and I can pull it out or cut it off before it jumps the bricks. Next we built and stained some raised beds with wood leftover from another building project and stain from our last house, to contain the creeping plants, raspberries and strawberries, and put the raised beds inside the brick-edged bed. Then we tilled up the soil, amended it with compost as we went and raked out the weeds as much as possible (note that when I say "we" and mention anything involving heavy lifting or large machinery, I don't actually mean the "I" part of "we" did anything more than offer moral support. Although I do know how to wield a rake or a shovel). After tilling came paper and mulch to keep in the water and keep the weeds down. In past years we've mostly used newspapers we've salvaged and saved as our weed block, but this year we bought large rolls of brown kraft paper at the hardware store which have the benefit of coming in large amounts with you can roll out quickly and also you have fewer overlap spots where weeds can wend their way through. Our city makes mulch out the brush they pick up around the year and sell it cheaply by the truckload (of course, owning a truck or in our case having a friend who will lend you one is important). We actually have one more raised bed for raspberries to install and therefore one more small section paper and mulch, but otherwise we're done with the planting and prettifying for this year. Now I just have to keep on top of the weeds which will inevitably make it past my defenses, keep it watered and fertilized and hope for a good harvest. Up next: what I planted this year. Reading that, I need to take a nap. I second Janis, though I am somewhat relieved that your husband helps out so much. That makes me feel less bad about my failure to do anything with the various seeds I've bought!